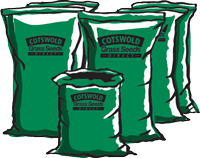 Cotswold Grass Seeds Direct is the sole owner of the information collected on this site. We will not sell, share, or rent this information to third parties. Cotswold Grass Seeds Direct contains links to other sites. Please be aware that Cotswold Grass Seeds Direct is not responsible for the privacy practices of such other sites. This privacy statement applies solely to information collected by this website. However, if you have any concerns about privacy on linked sites please let us as know.